Generally there will be a spec sheet for each broadcaster (i.e. ABC, CBS, BBC, etc) that your client will provide when asked. Spec sheets aren’t necessarily public or available online but some are (such as NBC Universal). Some online content providers (like Amazon), movie theater chains, and movie distributors also have specs, so it’s always good to ask. Before 2012, there used to only be one loudness spec: peak loudness. This was a brickwall limiter placed at the end of the chain. Back then, most television networks (in North America) had a peak level of -10dBfs. From the outside (especially coming from the music world) it seems like an odd way to mix – basically you’ve got 10 dB of empty headroom that you’re not allowed to use. As long as your mix was limited at -10dB, it would pass QC even if it was squashed and sounded horrible. That’s what was happening, though, especially with commercials that were competing to be the loudest on the air. If you remember running for the remote every commercial break because they were uncomfortably louder, that was the issue. In the US, Congress enacted the CALM act which went into effect in 2012 and required broadcasters to reign in these differences in loudness between programs and commercials. The spec that evolved from this was “average loudness level.” A loudness measurement covers the length of the entire piece, whether it’s a 30 second spot or a 2 hour movie. Average loudness is measured through a loudness meter. Popular measurement plugins are Izotope Insight, Waves WLM and Nugen VisLM. Dolby Media Meters was a standard for many years but is no longer being supported. To understand some important concepts, we’ll take a look at PBS’s most recent specs (2016), found here. For PBS, it’s a 21-page document that includes requirements for video, audio, how to deliver, file naming, closed captioning, etc. It gets pretty detailed, but it’s a good example of what a spec sheet looks like and the types of audio requirements that come up. The information in the spec sheet will dictate some details in your session, such as track layouts for 5.1, where your limiters should be set, dialog level, bars and tones, etc. We’ll break down a few of these important elements. Peak Loudness: -2dBTP (“true peak” or 2 dB below full scale). This is your brickwall limiter on the master buss/output of the mix. In this case, it would be set to -2dB. Average Loudness: – 24dB LKFS +/-2 LU. ITU BS 1770 Algorithm: ITU-R BS.1770-3. This is the algorithm used to measure average loudness. The ITU developed an algorithm (ITU BS 1770) to calculate average loudness. The latest algorithm is 1770-4 (still used in 2018). In technical terms, loudness is an LEQ reading using a K-weighting and full-scale; the designation for this reading is “dB LKFS”. 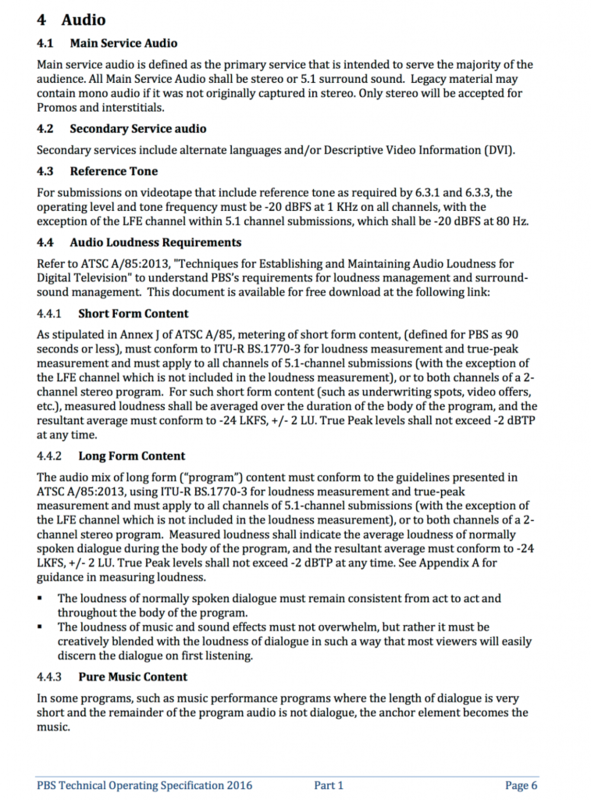 In the PBS spec sheet, section 4.4.1 and 4.4.2 say mixes should use ITU BS 1770-3, which is an older algorithm. This is an important detail, though, because when you’re measuring your mix, the plugin has to be set to the correct algorithm or the reading may be off. The PBS specs were written in 2016 (before 1770-4 came out). Broadcasters update these every couple of years, especially as technology changes. In this PBS spec, the optimal average loudness is -24dB LKFS, but there is an acceptable loudness range (LRA) above and below +/-2 LU (“Loudness Units”). Basically that means your average loudness measurement can fall on or between -26dB LKFS and -22dB LKFS, but ideally you want to mix to hit at -24dB LKFS. 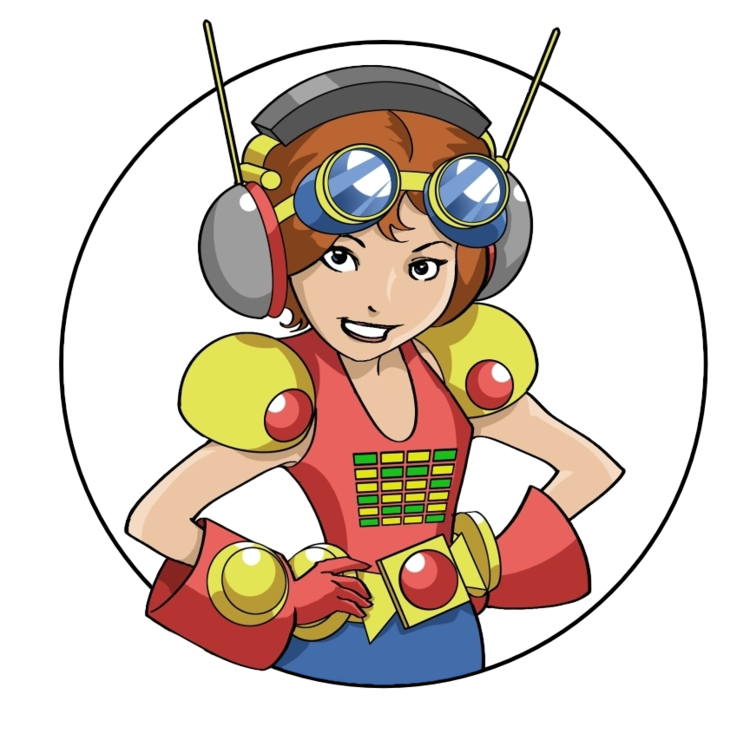 The measurement plugin will probably show a short term and a long term value. The short term reading may jump all over the place (including beyond your in-spec numbers). The overall (long) reading is the important one. If the overall reading is out of range, it’s out of spec, won’t pass QC and will likely be rejected for air. Or, it may hit air with an additional broadcast limiter than squashes the mix (and doesn’t sound good). As HD television has become more popular, broadcasters have loosened up on the peak loudness range. PBS is pretty liberal with -2dBTP (or -2dBfs); some broadcasters are at -6dBfs and occasionally some are still at -10dBfs. 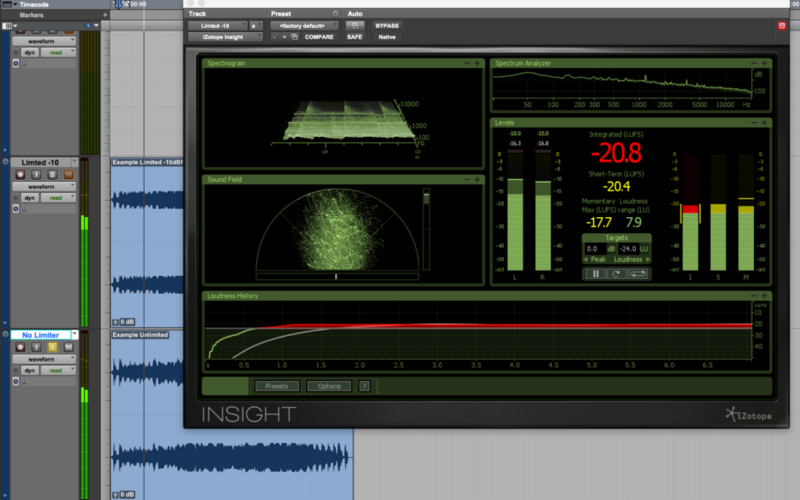 Screenshot of a mix with a limiter at -10dBfs (you can see the compression smashing the mix. It doesn’t sound very good!) and the same mix without. If your average loudness reading is too hot and your mix looks like the upper, there’s a good chance that your mix (or dialog) is overcompressed. When the CALM Act went into effect, re-recording mixers thought loudness metering would be restrictive to creative mixing. Average loudness is measured across the entire program so there’s still room for some dynamic range short term. Loudness specs can be a problem for certain content, though. For example, if you’re mixing a show with a cheering audience, the cheering is still picked up as dialog by the loudness meter. You could have a spec of -24dB LKFS (+/-2), mix the show host at -24dB LKFS (in spec), but every time the audience cheers the short term measurement is -14dB LKFS. The overall loudness measurement might be -18dB LKFS – which is way out of spec! So sometimes you end up mixing dialog on the low side or bringing down an audience more than feels natural to fall in spec. Another difficulty of mixing with a loudness spec is making adjustments when your overall measurement is out of spec. A dB of LU (the unit of measurement for average loudness) is not the same as 1dBFS (full scale). If you drop the mix 1dB by volume automation, it’s not necessarily a 1dB change in average loudness. 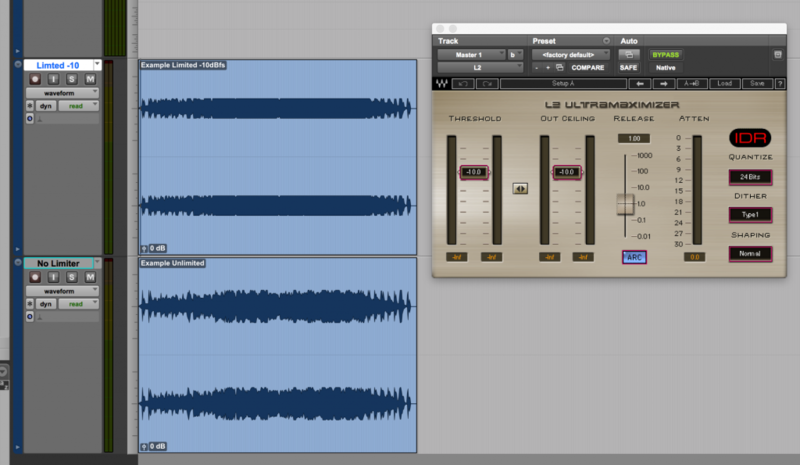 If you’re mixing a 30 second promo and the loudness level is out of spec it’s easy to adjust and recheck. If you’re mixing a 90 minute film, it takes a bit more work and time to finesse the mix and get a new measurement. There’s software that will make these adjustments for you – basically you can tell the software what the specs are and it’ll make small adjustments so the mix will fall in spec. While this is a good tool to have in the toolbox, I encourage mixers to first learn how to adjust their mix by hand and ear to understand how loudness measurements and metering works. I find in general if dialog is sitting between -10 and -20dBfs (instantaneous highs and lows) and not over-compressed, the average loudness reading should fall pretty close to -24dB LKFS. When I first started mixing to an average loudness spec, my mixes were often averaging hot (-20 to -22dB LKFS) when spec was -24. My ear had become accustomed to the sound of compressed dialog hitting a limiter on the master buss. What I’ve learned is that if you’re mixing with your dialog close to -24 dB LKFS (or -27 for film) you can bypass the master limiter and it should sound pretty seamless when you put it back in. If you’re noticing a big sound change with the limiter in, the overall reading will probably fall on the hot side. When I start a mix, I usually dial in my dialog with a loudness meter visible. I’ll pick a scene or a character and set my channel strip (compressor, EQ, de-esser, noise reduction etc) so the dialog mix lands right on -24dB LKFS. I do this to “dial in” my ear to that loudness. It then acts as a reference, essentially. One thing I like about mixing with a loudness spec is you don’t have to mix at 82 or 85 dB. While a room is optimally tuned for these levels, I personally don’t always listen this loud (especially if it’s just me/no client or I anticipate a long mixing day). Having a loudness meter helps when jumping between reference monitors or playing back through a television, too. I can set the TV to whatever level is comfortable and know that my mix is still in spec. When I’m mixing in an unfamiliar room, seeing the average loudness reading helps me acclimate, too. I mix most projects to some sort of spec, even if the client says there are no specs. For indie films, I usually mix at -27dB LKFS and a limiter set to -2dBFS or -6dBFS (depending on the content). If an indie film gets picked up for distribution, the distributor may provide specs. Sometimes film festivals have specs that differ from the distributor, too. If you’ve already mixed with general specs in mind, it may not need adjusting down the road, or at least you will have a much better idea how much you’ll need to adjust to be in spec.